Luxurious & Charming 1 bedroom, 1 bath cottage with a view of the inter coastal waterway. Located just 10 short minutes from downtown Charleston and within walking distance of restaurants, a movie theater and coffee bar. Large sectional sofa can be used as a day bed for 2 persons. 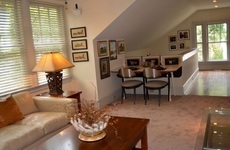 Gourmet kitchen, washer & dryer, cable TV & WiFi internet all included. Parking available. Cottage is adjacent to our main home and entire property is secured with privacy fencing and a security gate. Enjoy Great Low Rates On Select Dates In Historic District!